, son of Lancelot Addison a. clergyman, born at Mauldismeaburne in the parish of Crosby Ravens worth in Westmoreland, in 1632, was educated at the grammar school of Appleby, and afterwards sent to Queen’s college, Oxford, upon the foundation. He was admitted B. A. Jan. 25, 1654, and M. A. July 4, 1657. As he now had greatly distinguished himself in the univer? sity, he was chosen one of the terras filii for the act celebrated in 1658; but, his oration abounding in personal satire against the ignorance, hypocrisy, and avarice of those then in power, he was compelled to make a recantation, and to ak pardon on his knees. 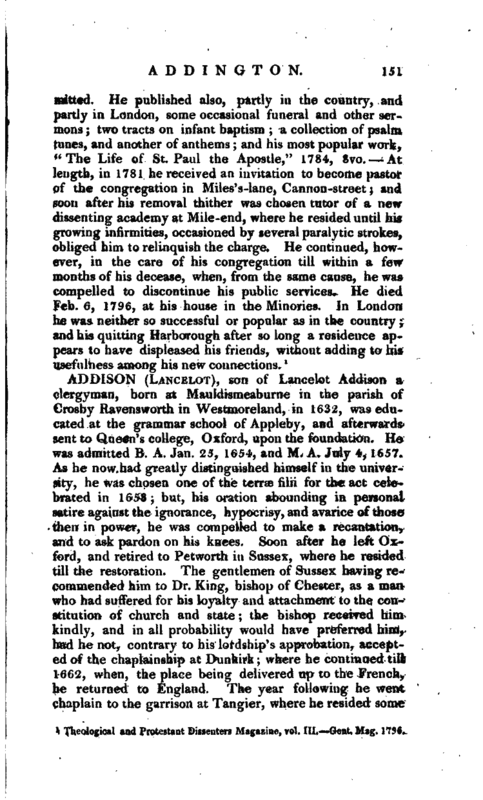 Soon after he left Oxford, and retired to Petworth in Sussex, where he resided till the restoration. The gentlemen of Sussex having recommended him to Dr. King, bishop of Chester, as a man who had suffered for his loyalty and attachment to th.e constitution of church and state; the bishop received him kindly, and in all probability would have preferred him, had he not, contrary to his lordship’s approbation, accepted of the chaplainship at Dunkirk; where he continued till 1662, when, the place being delivered up to the French, he returned to England. The year following he went chaplain to the garrison at Tangier, where he resided some | years; and came back to England in 1670, with a resolution to return to Tangier. 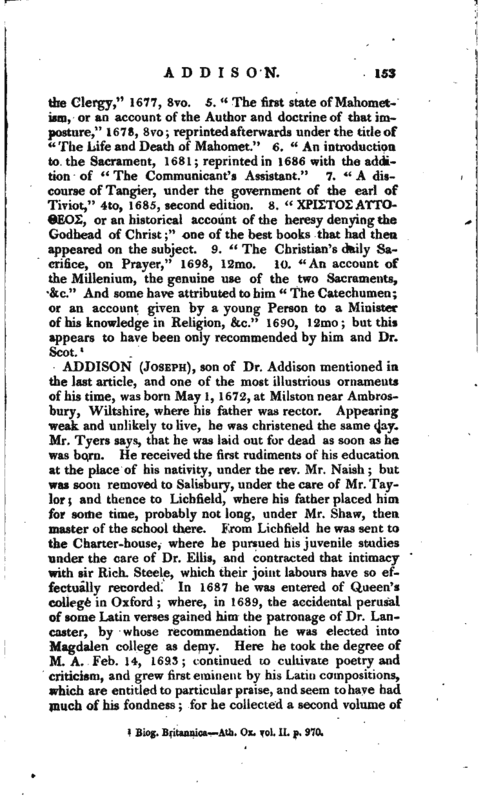 He was appointed chaplain in ordinary to his majesty soon after his coming over; but had no thoughts, however, of quitting his chaplamship at Tangier, until it was conferred upon another, by which Mr. Addison became poor in his circumstances. In this situation of his affairs, a gentleman in Wiltshire bestowed on him the rectory of Milston, in Wilts, worth about 120l. per annum. Soon after he was also made prebendary of Minor pars altaris, in the cathedral of Sarum; and took the degrees of B. and D. D. at Oxford, July 6, 1675. His preferments, though not very considerable, enabled him to live in the country with great decency and hospitality; and he discharged his duty with a most conscientious diligence. In 1683 the commissioners for ecclesiastical affairs, in consideration of his former service at Tangier, conferred upon him the deanry of Lichfield, in which he was installed July 3; was collated to the archdeaconry of Coventry Dec. 8, 1684, and held it with his deanry in commendam. In the convocation, which met Dec. 4, 1689, dean Addison was one of the committee appointed by the lower house to acquaint the lords, that they had consented to a conference on the subject of an address to the king. 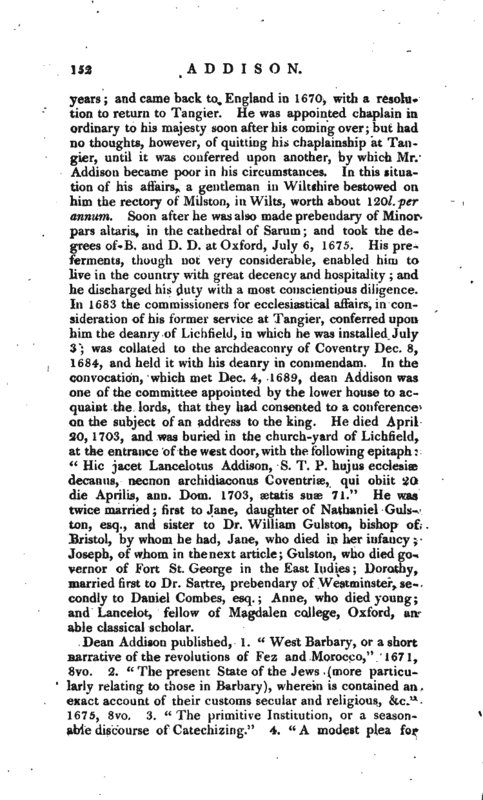 He died April 20, 1703, and was buried in the church-yard of Lichfield, at the entrance of the west door, with the following epitaph “Hie jacet Lancelotus Addison, S. T. P. hujus ecclesiae decanus, necnon archidiaconus Coventrise, qui obiit 20 die Aprilis, ann. Dom. 1703, aetatis suae 71.” He was twice married; first to Jane, daughter of Nathaniel Gulston, esq., and sister to Dr. William Gulston, bishop of Bristol, by whom he had, Jane, who died in her infancy; Joseph, or whom in thenext article; Gulston, who died governor of Fort St. George in the East Indies; Dorothy, married first to Dr. Sartre, prebendary of Westminster, secondly to Daniel Combes, esq. ; Anne, who died young; and Lancelot, fellow of Magdalen college, Oxford, an able classical scholar. Biog. Britannica—Ath. 0x. vol II. p. 970.